By the end of 1942 U-boats operating from ports in Germany and occupied Europe had sunk just over 1,160 ships (see Battle of the Atlantic). U‑boats claimed nearly 70 per­cent of all Allied and neu­tral shipping losses (about 7.8 million tons), and the Kriegs­marine appeared to be winning the ton­nage race, sinking one million more tons of shipping than was built in 1942. On this date in 1943 in France, the U.S. Eighth Air Force blasted the heavily fortified U‑boat base at St. Nazaire on the Bay of Bis­cay, home to the Sixth and Seventh Kriegs­marine Flotillas. Built between 1941 and 1942, St. Nazaire was one of five bases on the French Atlantic coast and could accom­mo­date the largest German U‑boats in its four­teen con­crete pens. (The other U‑boat bases were at Brest, Lorient, La Rochelle, and Bordeaux.) Thirty-six-year-old Col. Curtis LeMay led 85 B‑17 Flying For­tresses and 13 B‑24 Lib­er­ators on the mis­sion. On this sixth attack on the facil­ity, the bombers dropped 171 tons of bombs using forma­tion pre­cision bombing tac­tics for the first time. (LeMay, com­mander of the 305th Bomb Group at Grafton-Under­wood in Britain, iden­ti­fied his best bom­bar­diers, made them “lead bom­bar­diers” for the for­ma­tion, and had all of the air­craft drop their bombs when the lead bom­bar­dier did.) As a result of this raid, the Allies im­ple­mented an in­cen­di­ary bombing cam­paign on French-based U‑boat pens and their surrounding cities in order to cut the supply lines to the U‑boat bases. (The city of Lorient, for ex­am­ple, was al­most com­pletely de­stroyed.) When LeMay mounted attacks against tar­gets in the Ger­man heart­land later in the year, he refined his fire­bombing tactics to in­crease cover­age. Indeed, over the course of the war in Europe, the bombing that damaged Ger­many most was not in­flicted by British avi­ators but Amer­i­can, who regu­larly used a high per­cent­age of in­cen­di­aries in the hope that a wider circle of destruc­tion would take out the tar­get. It came at a heavy price, though. For the bomber offen­sive as a whole, the Eighth Air Force lost 4,182 air­craft from a total of 273,841 attacking, a rate of 1.5 per­cent. The RAF’s Bomber Com­mand air­craft loss rate for the same peri­od was 2.5 per­cent. The 250,000 air­crew mem­bers who flew bomber mis­sions in the Eighth Air Force sus­tained 58,000 casualties—18,000 killed, 6,500 wounded, and 33,500 missing. Left: The Kriegsmarine’s St. Nazaire base in its late stages of completion, April 1942. 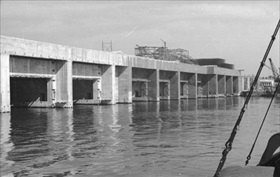 The building of the massive U-boat pens on France’s west coast began under Adm. Karl Doenitz, then supreme commander of the U‑Boat Arm, in February 1941 with pens 6, 7, and 8, which were completed in June 1941. From July 1941 to January 1942, pens 9 through 14 were built, followed by pens 1 through 5 between February and June 1942. The base, at 984 ft (300m) long and 426 ft (130m) wide, was protected by a four-layer, 59-ft- (18m-) high roof dotted with anti-aircraft weaponry, machine guns, and mortars. (St. Nazaire had the most complete roof structure of all the Bay of Biscay bases.) The defenses of the five German U‑boat fortresses in France were so strong that Gen. Dwight D. Eisen­hower, Supreme Allied Commander in Europe, ultimately decided to seek their containment rather than their destruction. 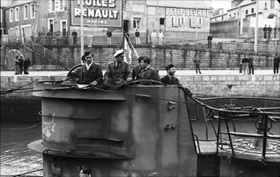 Right: On September 29, 1940, the first U-boat arrived in St. Nazaire, three months after France’s surrender. 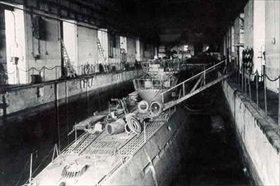 U‑203, the first boat to use the new bunker at St. Nazaire, arrived on June 30, 1941. The boat was sunk April 25, 1943, by British aircraft and a British warship. In this photo from June 15, 1942, a U‑boat is seen entering or leaving the harbor. The base was fully operational by October 1942, with both the Sixth and the Seventh U‑Boat Flotillas calling St. Nazaire home. Left: St. Nazaire pens 1 through 8 were dry docks, 301 ft (92m) long and 38 ft (11m) wide; pens 9 through 14 were wet pens, 223 ft (62m) long and 55 ft (17m) wide, each capable of holding two sub­marines. When built out, the St. Nazaire U‑boat base could accommodate 20 U‑boats. The base was equipped with 62 work­shops for pre­paring torpe­does, repairing engines and motors, welding, etc. There were 97 stores for storage of spare parts, 150 offices, 92 indi­vid­ual and group dormi­tories for sub­marine and main­te­nance crews, 20 pumping stations, 4 kitchens, 2 bakeries, 2 electrical plants, a restaurant, and a hospital. Right: This photo shows Field Marshal Erwin Rommel (left) inspecting the St. Nazaire base on Febru­ary 18, 1944, from the roof during one of his inspections of the Atlantic Wall. 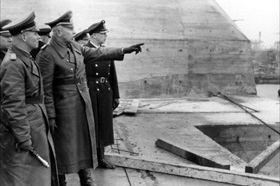 To Rommel’s left are army Gen. Wilhelm Fahrm­bacher (pointing) and harbor com­man­dant Com­mander (Fregatten­kapitän) Ernst Keller­mann. The pens still stand, their extremely sturdy construction making demolition impractical. Today they are home to cafes, a bar, and on the roof an exhibition about St. Nazaire.